CARFAX Certified 1 Owner - Fully Serviced - QUALITY CERTIFIED up to 10 YEARS 100,000 Miles WARRANTY This Mercedes-Benz includes: PREMIUM PACKAGE HD Radio Universal Garage Door Opener Heated Front Seat(s) Satellite Radio Power Door Locks Keyless Entry Premium Sound System PANORAMA SUNROOF Generic Sun/Moonroof Sun/Moonroof Dual Moonroof DRIVER ASSISTANCE PACKAGE Lane Departure Warning Lane Keeping Assist Adaptive Cruise Control Blind Spot Monitor RADIO: HARMAN/KARDON LOGIC 7 AUDIO SYSTEM Premium Sound System HEATED FRONT SEATS Heated Front Seat(s) REARVIEW CAMERA Back-Up Camera *Note - For third party subscriptions or services, please contact the dealer for more information. 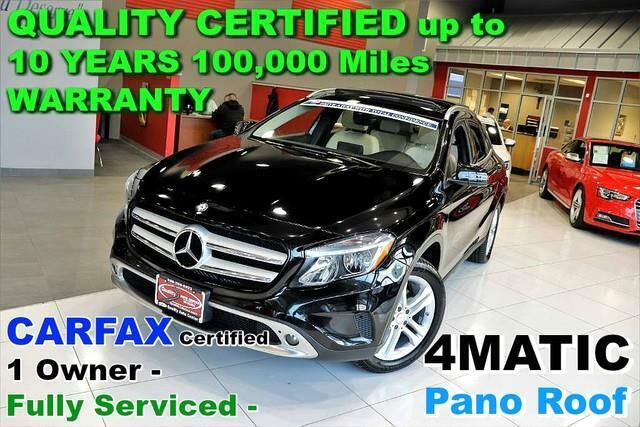 * The CARFAX report for this 2016 Mercedes-Benz GLA GLA 250 4MATIC - CARFAX Certified 1 Owner - Fully Serviced - QUALITY CERTIFIED up to 10 YEARS 100,000 Miles WARRANTY highlights that it's a One-Owner vehicle, and for good reason. A One-Owner vehicle gives you the feel of owning a new vehicle without paying the new car price. Perfect for the on-the-go family, this Mercedes-Benz GLA GLA 250 4MATIC - CARFAX Certified 1 Owner - Fully Serviced - QUALITY CERTIFIED up to 10 YEARS 100,000 Miles WARRANTY is an SUV everyone will love. With exceptional mileage, options and power, you'll insist on driving it on all your outings. The greater your fuel-efficiency, the less your carbon footprint. And with exceptional MPGs, this Mercedes-Benz GLA treads ever so lightly on Mother Earth. This AWD-equipped vehicle will handle beautifully on any terrain and in any weather condition your may find yourself in. The benefits of driving an all wheel drive vehicle, such as this Mercedes-Benz GLA GLA 250 4MATIC - CARFAX Certified 1 Owner - Fully Serviced - QUALITY CERTIFIED up to 10 YEARS 100,000 Miles WARRANTY, include superior acceleration, improved steering, and increased traction and stability. Know exactly what you're getting when you take home this Mercedes-Benz GLA as past service records are included. This gently driven vehicle has been well-kept and still has the showroom shine. The 2016 Mercedes-Benz GLA is built with pure muscle. Punch the throttle and feel the power of its torque and horsepower plant you firmly to the back of the seat. One look at the finish of this Mercedes-Benz GLA and you'll wonder if it ever spent a day outside of the garage. A perfect find to complement any rare automotive collection. This beautiful lass will turn heads everywhere she goes. More information about the 2016 Mercedes-Benz GLA: Mercedes-Benz enters the increasingly crowded luxury compact crossover segment with the GLA-Class. Its sedan underpinnings and small stature make it a nimble performer, with favorable comparison against competition from BMW and Audi. The high-performance GLA45 AMG takes things to a different level, however, and nothing from any manufacturer can rival it. This model sets itself apart with athletic handling, superb power in AMG guise, and Available technology and safety features No Credit / Bad Credit / No Paystubs, No problem !! ! All Approved ! Everyone drives ! CLEAN, GORGEOUS, LOW MILES, SHOWROOM CONDITION. CALL NOW QUALITY CERTIFIED up to 10 YEARS 100,000 MILE WARRANTY , To Certify a vehicle, there will be an additional cost for Certification. CALL NOW For details. STUNNING AGGRESSIVE LOOK ON THIS BEAUTIFUL--Call today to schedule a test drive... Good Credit/Bad Credit/No problem!!!! Get paid cash? No problem!! 100% Credit Approval with interest rates starting at 2.49% for qualified customers, our rates will not be beaten. We price our cars at wholesale price to guarantee the best deals for our customers. Our inventory moves quick, please call to confirm the availability of the vehicle of your interest Springfield location 973-564-0112. This vehicle is located at our SPRINGFIELD location. Come visit our new showroom in Springfield NJ. Quality Auto Center has a wide selection of exceptional pre-owned vehicles to choose from, including this 2016 Mercedes-Benz GLA. Want more room? Want more style? This Mercedes-Benz GLA is the vehicle for you. The less money you spend at the pump, the more money you'll have to spend on you. So why not consider this wonderfully styled, fuel-efficient Mercedes-Benz GLA. No matter the varying terrain or weather conditions, this all-wheel drive vehicle will help you reach your destination safely and securely in a well-appointed cabin with many features found on cars twice the price. More information about the 2016 Mercedes-Benz GLA: Mercedes-Benz enters the increasingly crowded luxury compact crossover segment with the GLA-Class. Its sedan underpinnings and small stature make it a nimble performer, with favorable comparison against competition from BMW and Audi. The high-performance GLA45 AMG takes things to a different level, however, and nothing from any manufacturer can rival it. Strengths of this model include athletic handling, superb power in AMG guise, and Available technology and safety features No Credit / Bad Credit / No Paystubs, No problem !! ! All Approved ! Everyone drives ! CLEAN, GORGEOUS, LOW MILES, SHOWROOM CONDITION. CALL NOW QUALITY CERTIFIED up to 10 YEARS 100,000 MILE WARRANTY , To Certify a vehicle, there will be an additional cost for Certification. CALL NOW For details. STUNNING AGGRESSIVE LOOK ON THIS BEAUTIFUL--Call today to schedule a test drive... Good Credit/Bad Credit/No problem!!!! Get paid cash? No problem!! 100% Credit Approval with interest rates starting at 2.49% for qualified customers, our rates will not be beaten. We price our cars at wholesale price to guarantee the best deals for our customers. Our inventory moves quick, please call to confirm the availability of the vehicle of your interest Springfield location 973-564-0112. This vehicle is located at our SPRINGFIELD location. Come visit our new showroom in Springfield NJ.